That’s a funny quote from an unknown source, but it is also a true statement. Smartphones are called that for a reason, they are very smart and we have come to rely on them as an extra appendage to our bodies. In fact, 85% of Americans are never more than three feet from their cell phones. How many people do you know that do not yet own a smartphone? Mobile devices, smartphones and tablet PCs, will soon eclipse desktops and laptops as the number one Internet access device. 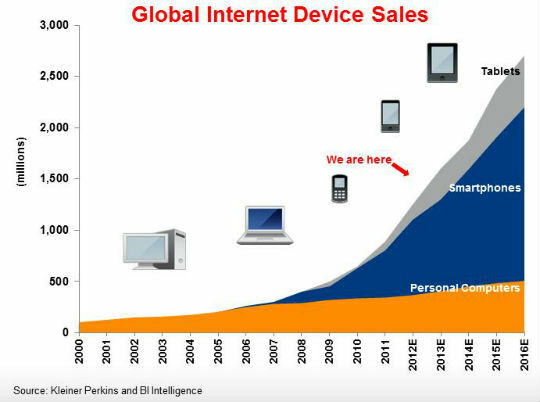 The first generation iPhone was released in 2007 and this graph illustrates the meteoric demand growth in which we find ourselves. What does smartphone growth mean to your business? Everything! If your website is not yet mobile friendly, you are already losing business. It is estimated that 25% to 40% of your website traffic is from mobile devices. Why? Because if a smartphone user visits your website and it is not optimized for mobile, they will not hang around; they’ll tap the back button and find a competitor whose site they can view on their mobile device. Have you viewed your website from a smartphone? See what your site looks like; visit our “Smartphone Simulator“. Due to the millions of tourists we see every year, Flathead businesses must have mobile optimized websites. Our visitors are not bringing their laptops with them on vacation, they carry their smartphones and use them to search for local businesses and services. 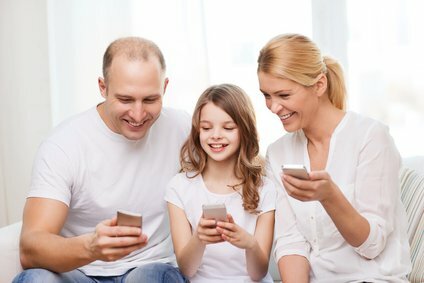 It has become a family affair, in most cases every member of the family is now carrying a smartphone. Regardless of the age of your average customer you can rest assured that if they visit your website it will often be on a smartphone. I know that this was not part of your plan when you paid hard earned cash to have your website developed, but optimizing your website for mobile today needs to be a #1 priority. As business people we must go where the customers are and they are on their smartphones. One of the primary objectives of the Flathead Guide is to target smartphone users and we do it very effectively. We display thousands of page views of businesses listed in the Flathead Valley Business Directory every month. A large percentage of our visitors each day are from mobile devices because we target those results and search engines are now prioritizing mobile results for searches made from mobiles. You do business in the Flathead and you benefit from the 91,000 residents and the 2.3 million annual visitors, but if you are not marketing to mobile users you are not getting your fair share. Your business can be listed in the Flathead Guide for about the cost of a gallon of gas each month. This is not like placing an expensive ad in the newspaper that displays one day and then disappears. Only $4 per month can launch your mobile marketing campaign with the Flathead Guide and it works for you 24x7x365. Still not sure? See all the benefits of being listed here. Life is what happens when your cell phone is charging, but those potential customers of yours are on their phones now and searching for businesses like yours! Get Listed, Get Found & Get More Sales!